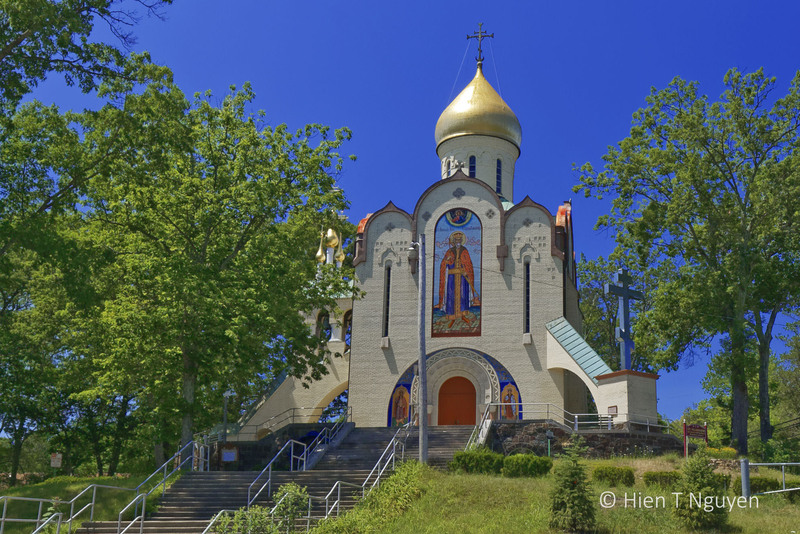 For those of us who long for a sunny day this January, here’s a photo taken on a sunny day last summer of a Russian Orthodox church in Jackson, NJ. I had taken pictures of it two years earlier, but on that day it looked so pretty I knew I had to stop! St Vladimir Memorial Church, Jackson, NJ. My pleasure Jackie! Thank you for commenting. it’s beautiful, but what’s that bright blue background behind the church? Thanks, Hien. It’s exactly what we need to see in this gray day. Thank you Helen! One of these days, I will ask them to let me inside to take some pictures. Very pretty. I had no idea that church was in NJ. Thought I was transported. I was also surprised when I saw it for the first time. Thanks Donna! Thanks, Hein. I’ve been missing the blue sky – it’s been so gloomy lately! I know. Somebody at work said that we haven’t seen the sun any day this month, until today! It is very striking, even from a distance. Glad you like it Donna! Thank you Katelon. It is a beautiful church! Thank you for commenting. I saw the photos you took in Moscow. There were quite a few onion domes there!